Today I came across a letter I'd received, years ago, from a priest who lived on a continent far away. As someone with a worldwide ministry, largely to underdeveloped countries and in a few lands not tolerant of Christianity, this man had witnessed trials I could only imagine. I read this now and ask myself: how often do I take the gift of Mass for granted? Do I look at it as the profound grace it is - or has it become, for me, simply routine? Do I focus so much on a church interior I do not like and a style of music I do not like that I forget that Jesus Himself is right there in front of me at the Consecration? When the homily is more about the local football team than about God, do I grit my teeth and sit in judgement - or do I silently pray for God's word to be spoken and heard? Do I make every attempt to pray from my heart? Do I thank God for the opportunity to be at Mass, and do I ever pray for those who are thoroughly aching to have such a privilege? I look at these questions and find my responses to them (if I'm honest) sobering. 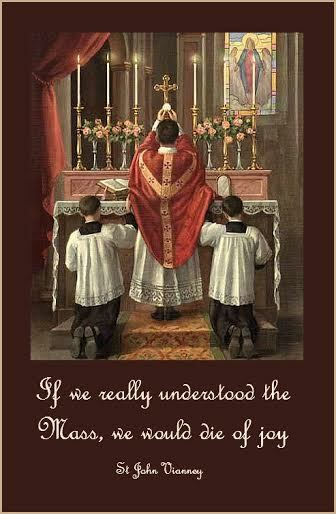 What a grace it would be to, as St. Jean Vianney prayed, really understand the Mass. Even if only for an instant. I would gladly risk dying of joy. Don, thank you for your most recent comment. Yes, you certainly may post this. I am thankful!